The 4:1 lens is of outstanding quality, and very good 8x10 or larger prints can be made from images captured at the S and F settings. Macro mode works well, permitting a portion of a business card to be a full frame. The 6 light level compensation settings (+/- 0.3, 0.7 and 1.0) allow the experienced photographer to access a shooting range without flash comparable to using films with ISO rating from 50-400. The auto-focus system works well under most conditions. Very quiet zoom operation, the lens is entirely contained within the body, so people don't know exactly what you are shooting. Combined with the good low light sensitivity, I'm able to routinely shoot hand-held candids. Third party LiIon Replacement batteries and NMH external packs are available for $25-30. The camera is designed for one handed (right hand) operation. May be difficult for left-handed persons to operate- controls are optimized for righties. Status display is on the side of the camera,requiring the monitor to be used in dim light, and multiple levels of menu selection using the zoom lever. This is a common problems with most P/S camera, but as a high-end entry, could be better. No external filter threads. Tripod mount is threaded plastic. No cable release. No remote. Internal battery provides capacity for 25 Superfine pictures, with flash and monitor on. No external charger available. There is no way to conveniently carry this camera in a fast-access position. A padded carry bag is a necessity, as the camera is too heavy to utilize the provided wrist lanyard, and the rear hand strap connection latch is not strong enough to support the weight of the camera. Kyocera/Yashica has stopped production of all cameras. 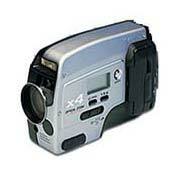 A very good general purpose camera, The DG2100 provides a high level of flexibility to meet most shooting requirements. If used in full automatic default mode, thje average photographer will be very pleased with the results this camera can provide. The experienced photographer, by adding an auto-slave remote flash and external battery pack, can take hundreds of great pictures in situations where most photographers and equipment couldn't. Like every other Kyocera/Yashica camera I've owned (I have 5), this camera has not required any service.